Commemorating the signing of the U.S. Constitution on September 17, 1787. On September, 17, 1787, the delegates of the Constitutional Convention signed the U.S. Constitution. 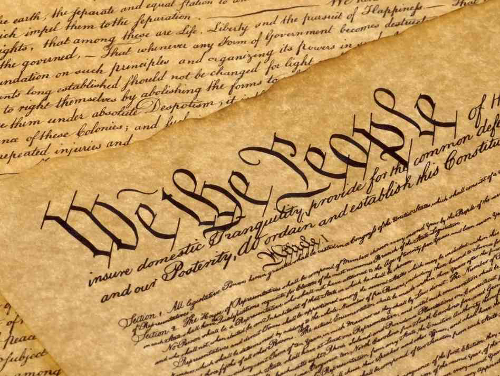 In 1956, Congress established Constitution Week, which begins on September 17th of each year. In 2004, September 17th was designated as Constitution Day—a day to learn about the U.S. Constitution and develop a better understanding of the documents behind the creation of the U.S. government. Here are more resources about Constitution Day and ways to celebrate it. From the United States Senate, this site provides the history behind the creation of Constitution Day, from establishing Constitution Week to Robert C. Byrd's inclusion of a provision in the Consolidated Appropriations Act of Fiscal Year 2005 to create Constitution Day itself. From the National Archives and Records Administration's Teaching with Documents section, this site provides information about Constitution Day, as well as activities, simulations, and other teaching units and lesson ideas. From the National Constitution Center, this site provides information about Constitution Day as well as educational resources, including an interactive constitution, lesson plans, videos, activities and resources, and a preamble kit. From ConstitutionFacts.com, this page explains the creation and ideas behind Constitution Day.